I am having so many problems with this today. I am really struggling with uploading photos. It doesn't like me centralising them all and when I do upload it it seems to jump to the top of the page even though the cursor is at the bottom, anyone know why, So this is why it will look higgledy piggledy today. Oh its all going horribly wrong, ther must be a simpler way to do this. Any tips anyone? Today has been a busy one, tidying, moving organising my studio. I finished a collection of work a few days ago and started a new one yesterday but just not been able to get into it as my studio is such a mess. 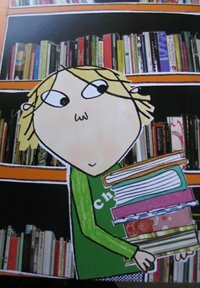 The image above by the way is Lauren Child one of my favourite illustrators. Whoo look at me adding links!!!! So here is part of my studio. Not completely tidy though, that is going to take more than a few hours. This is my wall of inspiration. It is so important for me to have lots around me to look at and inspire me. 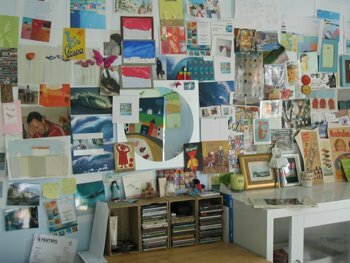 Here I have images from other artists, cut outs, telephone numbers, sketches etc etc. More to come. I tried to put close ups in here but not having fun with it! So I am going to leave you today until Monday when I have properly cracked it. We are off to Brighton (the South Coast of England) tomorrow. I used to live down there and we are off to stay with friends. I am also taking some prints down with me to show a few galleries. Brighton is a shoppers paradise too so i am sure I will be back with some delights. I am going to spend the rest of this evening adding links to the side of this page of inspiration. One last try at a photo and then i am hitting the publish button. Tell me this gets easier!